There are many days in motherhood that I can so easily focus on our shortcomings as a family — and even more specifically, my shortcomings as a mom. I am not sure what stage of mothering or parenting you currently find yourself in, but right now I find myself smack in the middle of an array of multiple ages and various needs. We have 12 children ranging in age from one to fourteen. I homeschool those who are school age, so often times my parenting and schooling are all meshed together. There are many days where I not only feel like I fail at parenting (as if that isn’t bad enough), but there are also days I feel like I fail at teaching! As moms — our plates are so full! They can be full of the demands of our children, our family, our time, and our energy that if we were to rely on our feelings alone we would ‘feel’ like we had missed the mark or at least fallen so very short. I know my greatest goal as a mom is to point my kiddos to Jesus. I want them to learn from my example that HE is enough, and that HE can meet all our needs. I want them to love people like He does and I want them to care about people like He does. I want their hearts to break for what breaks His and live a life that glorifies Him. But how to I get them there? HOW — on the days where it feels like we are all just a hot mess — do I point them to Christ? There are, of course, all of the obvious spiritual disciplines — make sure I am seeking God and spending time with Him regularly, taking the time to lead the children in doing the same, memorize scripture, and read His Word together — but is there more? I think that as moms one of the things we do all too quickly is judge ourselves by OUR own expectations. We often do this without even checking to see if our expectations line up with God’s expectations. There are so many times that I feel like I have missed the mark, but I am looking at the wrong things! It’s like looking at a painting and judging it as if it were a sculpture. If I am looking at a magnificent painting, yet judging it on the expectations I would have of a sculpture, I am likely to miss the beauty of the painting altogether. Much the same way, if I am looking at my children or family with the standards or expectations of another family, we will always fall short! ALWAYS! And just as I am likely to miss the beauty of a painting by holding it against the expectations of a sculpture, I can easily miss the very special and unique beauty in our family if I am comparing it to someone else’s. I will be very honest here, comparison is something I have struggled with for a long time, and sometimes still do. Our family is extremely unique, with our TWELVE children! The sheer number of us draws attention and causes us to stand out, but in addition to the quantity of people in our family our children are also a beautiful array of colors and shades — and we’re NOT quiet. If I had a dollar for every time I am asked if I run a daycare, or if we are a school, I would be rich. I had planned to have a bigger than normal family my whole life. God had laid that desire on my heart early on, but I never considered that it would look quite like this. The interesting thing about saying, ‘yes’ to God is that His plans are often so much grander than what we envision! I had always imagined our family photos with children that looked like my husband and I, complete with coordinating outfits, everyone’s hair in place, posing on the beach — an image that in my mind reflected the financial security I expected we would have. It’s hard to not laugh as I write this because, at this stage I am happy when we show up to church and everyone has remembered to put clean clothes on — and SHOES! I know right?!?! Who shows up to church without shoes — WE DO! Yet as easy as it is for me to think, “God, I am so sorry I couldn’t get it together today,” God is just so kind and gracious. He gently reminds me of what He sees in my husband and I. He sees two parents who LOVE Him. He sees us open our doors to children whose parents can’t care for them. He sees my biological children love on our foster children with a love and grace that can only be from Him. He sees the hot mess we sometimes appear to be, but He also sees us run to Him and ask for help. HE SEES. Just let that sink in for a minute. The God of the universe LOVES you and SEES you, right where you’re at. He sees the hot mess we sometimes appear to be, but He also sees us run to Him and ask for help. HE SEES. Just let that sink in for a minute. The God of the universe LOVES you and SEES you, right where you’re at. In Zephaniah 3:17 (ESV) it says, The LORD your God is in your midst, a mighty one who will save; he will rejoice over you with gladness; he will quiet you by his love; he will exult over you with loud singing. He loves you whether your children remember their shoes or not and whether or not dinner is on the table on time. He loves you just as much whether it’s pancakes for supper or steak. He loves you just as much when the house is clean as He does when it’s a mess. Your worth is not found in what you do. Your worth and beauty are found only in Him. He. Loves. You. I love this section in Ephesians 2:4-10 (ESV) But God, being rich in mercy, because of the great love with which he loved us, even when we were dead in our trespasses, made us alive together with Christ – by grace you have been saved – and raised us up with him and seated us with him in the heavenly places in Christ Jesus, so that in the coming ages he might show the immeasurable riches of his grace in kindness toward us in Christ Jesus. For by grace you have been saved through faith. And this is not your own doing; it is the gift of God, not a result of works, so that no one may boast. For we are his workmanship, created in Christ Jesus for good works, which God prepared beforehand, that we should walk in them. 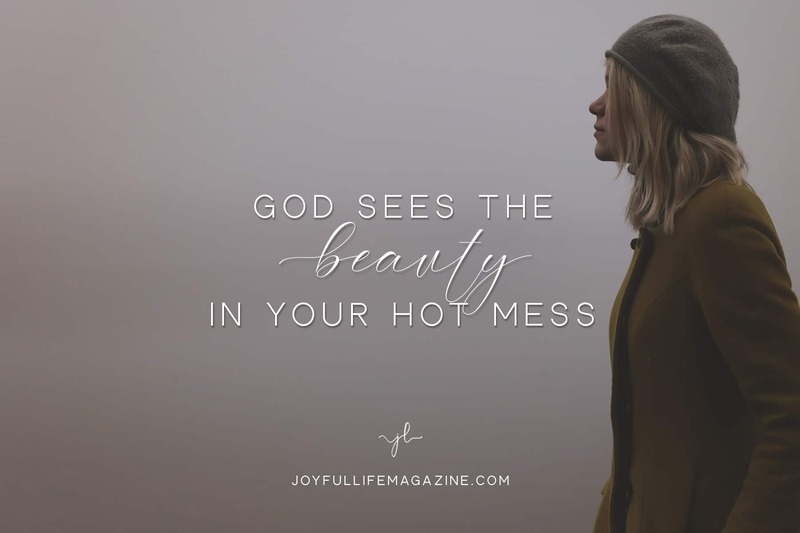 He sees beauty where we see a ‘hot mess’. He has a plan — He is not looking for perfection but rather at our desire for Him. He wants us to run to Him with EVERYTHING. There’s nothing too small or unimportant in your life — He wants you to seek Him in the midst of all of it. Let Him remind you, sweet momma, of the beauty that is right before you — right now. There’s beauty even when the children don’t behave perfectly. There is beauty even in a messy house. There is beauty even in a school day that didn’t go as planned. There is beauty to be found all around you. Ask for eyes to see the things that He is celebrating about you and your family right now, right where you are, in this season. Chances are that if you are following after Christ you are very aware that in your own strength you will never be enough — you were never meant to be, He didn’t create us to be self-sufficient. He wants our dependence to be fully on Him. The good news is — He is ALWAYS enough and He delights in helping us see the beauty in each and every day and circumstance. Faythe and her husband Ryan live in sunny SW Florida with their 12 kiddos and 4 Golden Retrievers. Faythe is a big supporter of moms and their families. She believes that a mom's job is like none other. Her and her husband recruit Christian foster families and are greatly involved in the recruitment and development of supporting foster and adoptive families. They are working to establish Building Families Ministries in order to help more families. You can read more from Faythe at building-families.com. I so enjoyed your thoughts, I was at first thinking it was going to be about mom’s in the stage of raising children. I had already been there but as I read it spoke to me in so many other facets of life no matter what age or stage in life. Thank you for the blessing of God to me! Thanks for reading!! I’m so glad it encouraged you. His beauty shines through you, so proud of you! Thanks Brenda =) So thankful that His mercies are new EVERY morning and there’s beauty all around us! Thanks Lynne!! He really is ALWAYS enough. Its so encouraging – love you lady!